By the age of 65, more than 25 percent of Americans lose all of their teeth. At Advanced Dental Health, we offer traditional and implant-supported dentures at their Phoenix, AZ, practice to restore compromised smiles. We can evaluate your oral health to determine if you are a candidate for dentures, and help you choose the best kind of denture for your needs. To schedule a consultation, contact us today. Dentures are prosthetics used to replace missing teeth. They usually consist of porcelain teeth embedded in a plastic gum-colored base that fits on top of your gums. They can be held in place with a combination of suction and dental adhesives, or with dental implants. Because most are detachable, they can be removed at night for thorough cleaning. With proper care, dentures can last many years. We offer both full and partial dentures. Full dentures are recommended to those who have lost all teeth in their lower jaw, upper jaw, or both. Partial dentures are recommended when a patient has some remaining healthy teeth. Dental implants provide the best stability for dentures. These titanium posts are surgically embedded in the jaw to replace lost tooth roots and anchor your denture. Meanwhile, implants are the only solution that can prevent the jaw atrophy that follows tooth loss. While traditional denture wearers must often have their dentures relined to accommodate changes in the jaw, implant-supported dentures rarely need refinement, if ever. While implant-supported dentures are not usually covered in full on most insurance plans, the extra investment can provide valuable benefits that last a lifetime. During your consultation, your dentist can determine if you are a candidate for dental implants. Our friendly staff can also explain available financing options and help you determine a solution for placing the cost of implant-supported dentures comfortably within your budget. Improved eating: All dentures can improve your ability to chew. Implant-supported dentures are especially effective because they allow patients to eat all the tough, crunchy, and sticky foods they love without worrying that the denture will slip out of place. Restored speech: Dentures can greatly improve your ability to enunciate. Implants are especially effective for preventing your denture from shifting as you speak. Preserved dental alignment: Partial dentures can prevent remaining teeth from shifting out of place. Cosmetic appeal: When you lose teeth, your jaw and facial structure often lose definition. Dentures can support the definition of the cheeks and lips, noticeably rejuvenating your appearance. At Advanced Dental Health, we want to help rejuvenate your smile and boost your confidence through advanced dentistry. 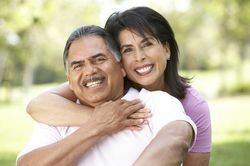 If you would like to learn more about dentures and how they can help you, contact us today to schedule an appointment. We will take all the time necessary to explain your options and help you make an informed choice.